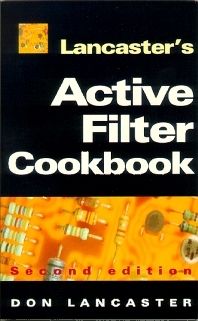 This Don Lancaster classic is by far the best-selling active filter book of all time. It gives you everything you need to know to build active lowpass, bandpass, and highpass filters. An active filter needs no inductors. Instead, op amps, resistors, and capacitors are used for better results. Advantages include lower cost, easy tuning, simple design, and modularity. Lancaster's Active Filter Cookbook includes practical elements such as working circuits, ready-to-use design tables, tuning, and real-world applications, making it easy to use and apply. You'll find both instant design and the mathematics behind coverage. Microcomputer pioneer Don Lancaster is the author of 34 books, 2 videos and countless articles and columns in technical magazines. He also heads Synergetics, an Arizona-based design and consulting firm. Electronics design professionals (RS, Farnell, Cirkit); communications engineers; students at undergraduate level, BTEC and HNC/D; hobbyists. Some basics; The operational amplifier; First- and second-order networks; Low-pass and high-pass filter responses; Bandpass filter response; Low-pass filter circuits; Bandpass filter circuits; High-pass filter circuits; Tuning, voltage control and elliptical filters; Applications; References; Index. Don Lancaster heads Synergetics-Arizona, an electronics design and consulting firm. He is the author of many best-selling books, including TTL Cookbook, Active-Filter Cookbook, and AppleWriter Cookbook.